Hey! There's only one picture here! There's a magnificent dent in the camera. There's a magnificent dent in the compact flash card. The flash card that was in my camera is dead. It contained all the pictures for Monday, so no pictures, for today. Fortunately Gaelen is here to pick up the slack. I have another, smaller flash card which I'll try to made do with. The battery, after recharging, seems to work. The dent makes it very difficult to insert or remove the flash card without a fair bit of persuading. The optics and electronics seem fine, which is fortunate. 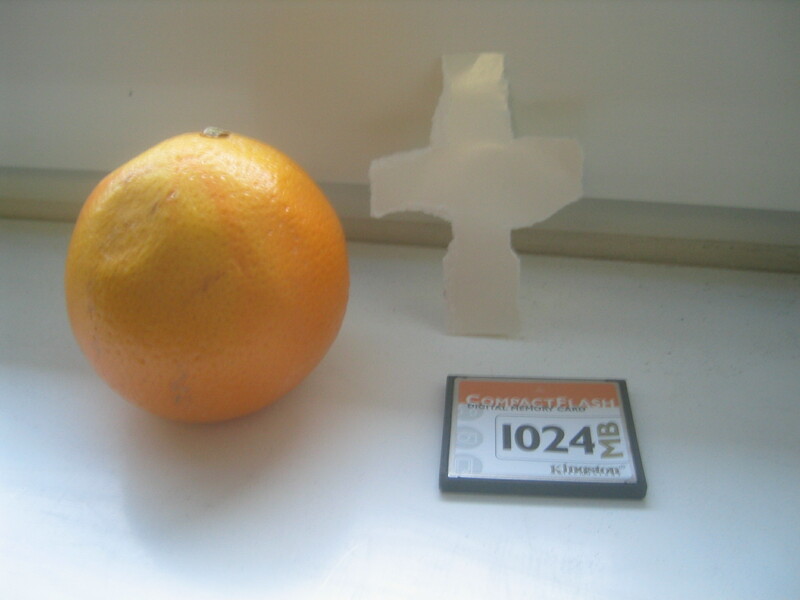 This picture shows the final resting place of the dead flash card, and was the first picture I took with the resuscitated camera. If you're wondering about the orange, I thought it would be appropriate to add some flowers to the picture, but they're hard to get in Antarctica, so I opted for the closest thing I could find.